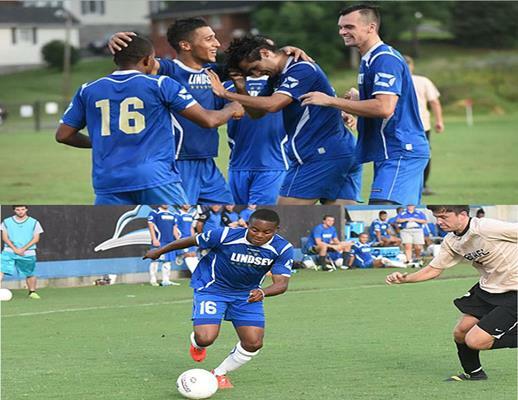 COLUMBIA, Ky. – The Lindsey Wilson men’s soccer team remains ranked No. 4 in the newest NAIA Men’s Soccer Coaches’ Top 25 Poll for the second-consecutive week, as released on Tuesday by the national office. The Blue Raiders (12-2-2) earned 503 voting points total, placing them 25 votes behind No. 3-ranked Texas at Brownsville (528; one first-place). Atop the leaderboard this week is Rio Grande (Ohio), which earned 560 total voting points as well as 19-of-20 first-place votes. The remainder of the top five consists of No. 2 Ashford (Iowa) (536) and No. 5 Indiana Wesleyan (486). The Blue Raiders (10-2-1, 5-0-1 MSC) are coming off a 3-0 win over Pikeville (Ky.) on Oct. 19, in which they clinched the Mid-South Conference regular-season title. Elijah Ukpong scored the first goal of the game in the 27th minute firing the ball into the net inside the 18-yard box.